Photograph by the Bureau of Reclamation; courtesy of the Grant County Historical Museum. 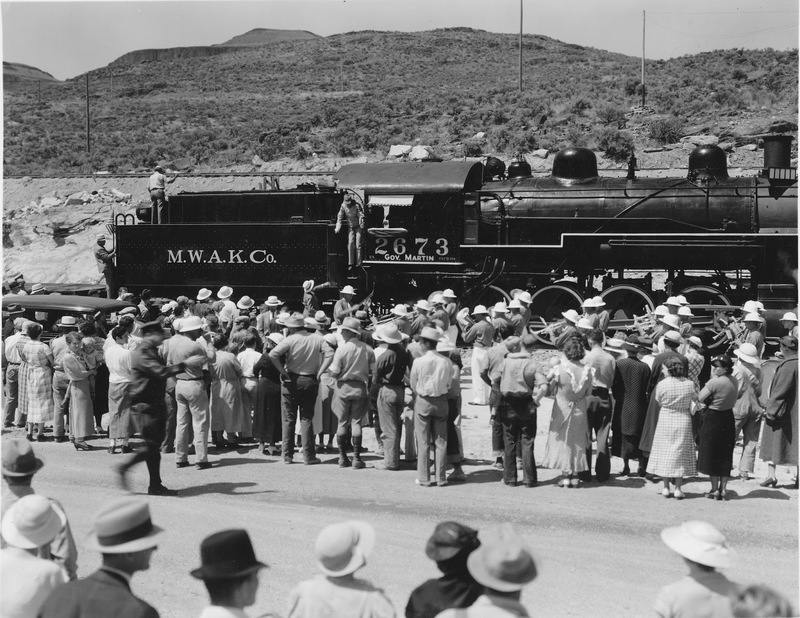 Washington Governor Clarence Martin was at the throttle of the first train to Grand Coulee on July 29, 1935. That’s him alighting from the cab in full engineer’s garb. The locomotive itself is new to the line this day, having previously served on the Southern Pacific since being built in 1903. It must not have been in the best shape, as in two years it will be set aside out of service. MWAK stood for the initials of the construction companies involved in construction of the Dam at the time; Silas Mason Co. from Louisville, Kentucky, Walsh Construction Co. of Davenport, Iowa and New York and Atkinson-Kier Company of San Francisco and San Diego.